Dave what voltages will classes and Outlaws run at? Thanks. Super Stock 13.6 volts. Econo Dragster 18 volts. Pro Street Outlaws 18 volts. Texas mailing address has been sent by PM to all race entrants for the group mailing to NZ. If I missed anybody or you haven't signed up yet, let me know and I will get it to you. 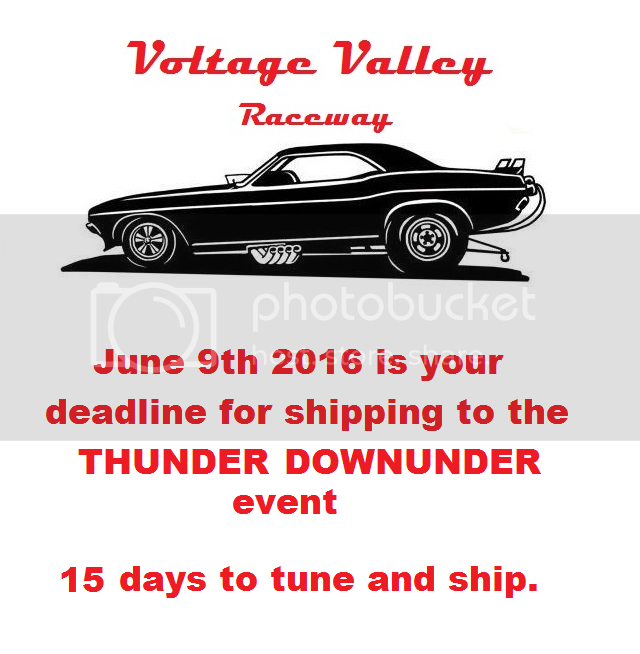 Looking forward to another great event from Voltage Valley Raceway. Looks like a light turnout, but the competition will still be fierce. Maybe some NZ racers will join in?? Please enter one econo and two super stock. Ok got mine cleaned up will box up and send to Jeff for the NZ race today. got you on the list Robert, Welcome to the race! Received cars from Eagle Racing yesterday. Put me in for two SS.And will be sending the Nomad. on the list Vince, welcome to the race. Cool, thank you Jeff. Still not to late to post cars. PM me for postal details. cars are going out today. I look forward to seeing the racing action. Thanks Dave! The race will be delayed by one week so as to get every ones cars here. Please post as soon as you can.